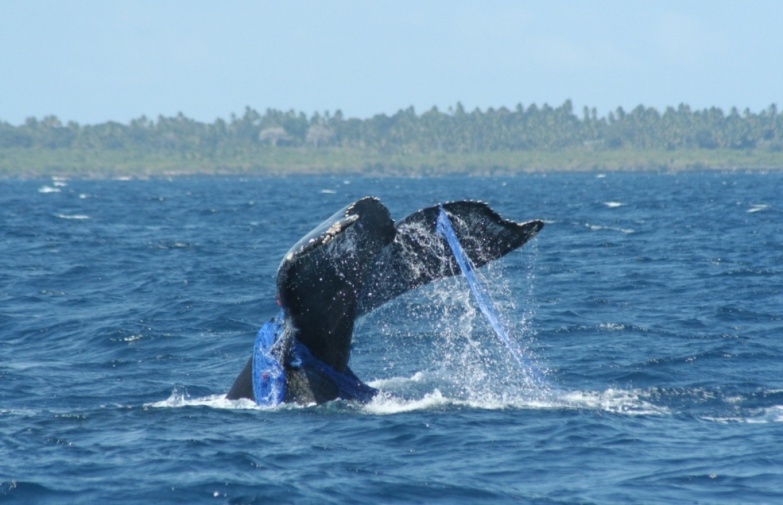 The humpback whales in Zanzibar coastal waters are being entangled in artisanal drift and bottom set gillnets and in lines to fish traps. This is bad both for the whales that may die unless they can free themselves from the gear and for the fishers that risk losing their equipment and only source of income. 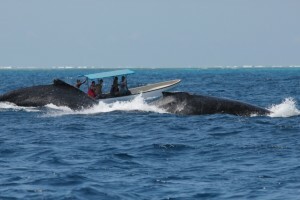 To address this problem and to assist in the development of sustainable whale watching as a potential new source of income to the local communities we arranged a 2-day Workshop 10-11 July 2012 at Kizimkazi-Dimbani on the south coast of Zanzibar. The Workshop built on two previous Workshops held in 2010 and 2011. The first day of the Workshop was dedicated to bycatch mitigation using “weak-links” as a possible mitigation measure which was introduced during the previous years’ Workshops and to assess the effectiveness of the disentanglement teams that was trained in 2010. The second day of the Workshop was dedicated to developing guidelines for sustainable whale watching. Each day was introduced by presentations for each Workshop topic by Dr Omar Amir (Zanzibar Ministry of Livestock and Fisheries) and Dr Per Berggren (Newcastle University) followed by discussions and recommendations from the Workshop. 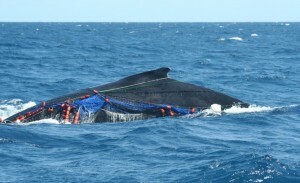 “Weak-links” make the nets break into smaller panels of nets if a whale swims into the net and can thus prevent entanglement which saves both whales and the fishers’ nets. Two “weak-link” nets were made in 2011 and have been trialled during the past year. Mr Pandu, the fisher responsible for the “weak-link” nets, reported that the nets have worked very well and had similar target fish catch as non-modified nets. No whales had been entangled in the “weak-link” nets during the trial year so it was not possible to assess their effectiveness to prevent whale entanglements. Mr Pandu still encouraged all fishers to introduce “weak-links” in their bottom set and drift gillnets. After some discussion all present fishers agreed that they would implement “weak-links” in their nets. Last year fishers were provided with the materials to make “weak-links” and arrangements were made at the Workshop for distribution of the materials. 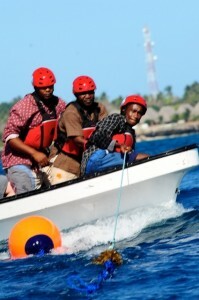 The disentanglement teams that were trained in 2010 and 2011 respond to whales that get entangled in nets and use specialised gear provided to free whales from the nets. The teams gave a demonstration at the Workshop of the gear and procedures for how to disentangle whales. There is currently one set of specialised gear and the disentanglement teams expressed the need for a second set so that there would be one available in the south and one in the north of the Island facilitating response in the two main fishing and likely entanglement areas. The Workshop agreed that it would be beneficial to demonstrate the use of the existing gear as an argument when seeking funds for a second set. 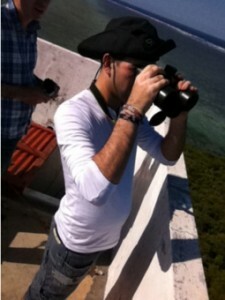 The second day of the Workshop was dedicated to developing guidelines for sustainable whale watching. The introductory presentations have information about current dolphin tourism in Zanzibar and plans for development of whale watching activities. 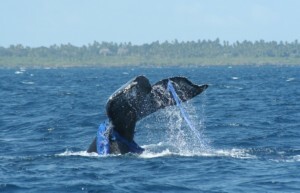 Further, information was presented on whale watching in other countries and the guidelines and regulations used in e.g. Australia and USA. This information was used as a starting point for discussion and Dr. Berggren further presented suggested guidelines for whale watching that was then discussed. The socio-economy of both dolphin tourism and whale watching was discussed and how the income for the local operators could be improved. Further, the current conflict between gillnet fishers that accidentally kill dolphins as bycatch and dolphin tourism operators was also debated. It was decided that these discussions would continue and be resolved in a meeting following the Workshop. Overall the Workshop was very successful with participants agreeing to use “weak-links” to mitigate whale bycatch in gillnets and agreement on the need to adopt guidelines for best practice for dolphin tourism and whale watching. Dr. Amir informed the Workshop that the Ministry of Livestock and Fisheries are preparing regulations for both fisheries and tourism activities within the Menai Bay and Mnemba Island Conservation areas. 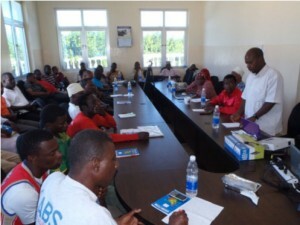 The Workshop was organised jointly by the Zanzibar Ministry of Livestock and Fisheries, the Institute of Marine Sciences, University of Dar es Salaam, with support from the Zanzibar Humpback Whale Research Project, the University of Newcastle, the US National Oceanic and Atmospheric Administration (NOAA) and the International Fund for Animal Welfare (IFAW). There were over 40 participants with representation from most stakeholders including: Government, fishers and their organisations, Kizimkazi Dolphin Tourism Operators Association (KIDOTOA) and the Menai Bay Conservation Area representatives and Researchers. 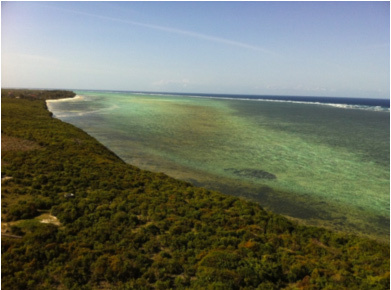 Just before arriving to the project, we received news that we had permission to conduct surveys from the Makunduchi lighthouse located on the southeast tip of Zanzibar Island! In addition to the vessel based surveys we would like to add a land-based component to the research this year. Land-based surveys are useful because they are less restricted by weather conditions and do not affect the data collection by disturbing the animals. Prior to initiating land-based surveys we wanted to visit the lighthouse to check if it would be suitable for binocular and theodolite surveys; if it was suitable the pilot study would be initiated over the next couple of weeks to collect additional data on humpback whale occurrence and behavior. Dr. 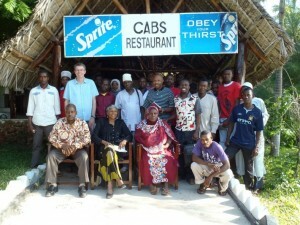 Per, Nat and Lynne landed in the Stonetown airport, Zanzibar on the morning of Saturday July 7th. Kristin and Kyla had arrived some days earlier and taken care of the first weekly food shopping in Stone town before meeting up with Per, Nat and Lynne at “our” house in the village Kizimkazi-Dimbani (on the southwest coast of the Island). 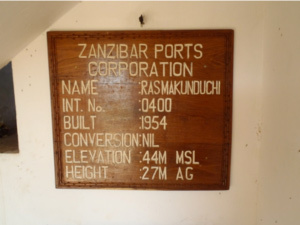 Almost immediately after arriving to the house Juma, the owner of our house, a local friend and working partner through IMS, drove us to Makunduchi to see the lighthouse. 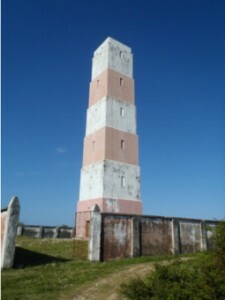 The drive from Kizimkazi-Dimbani to Makunduchi is only 20 minutes but from the village to the lighthouse the track was not good at all; we bounced over sharp coral rag and sharp bushes scratched and squeaked along the sides of the car! We cringed with each squeak and hoped Juma’s car was not too damaged by the trip. 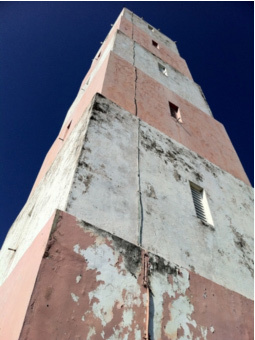 The lighthouse looming above us! When we arrived we piled out of the car and looked up at a beautiful red and white (but peeling and somewhat faded!) stone lighthouse looming above us. Two local men (Mr. Abdallah and Mr. Maneno), responsible for the upkeep and maintenance of the lighthouse, were there to meet us and show us around. 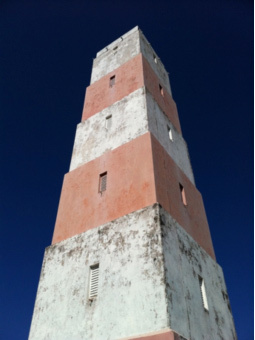 After a brief exchange of greetings in Swahili we were soon climbing the 165 steps to the top of the 27 m building (44 m above sea level). The climb was definitely worth it…views of the sea along the east and south coasts and the villages and low, scrubby forests of the island stretched out before us. It was quite peaceful at the top of the lighthouse with the sound of sea breezes and goats bleating in the shrubbery below. We were keen to spot whales and immediately began scanning with our binoculars but, unfortunately for us, there were no whales this time. It is early in the season so we anticipate whales soon and after seeing the lighthouse decided it will be a feasible location for a pilot study. Blog 1: Touch down in paradise…the team arrives in Zanzibar! 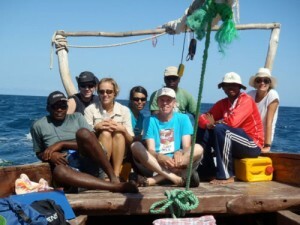 It’s hard to believe it’s been eight months since Zanzibar Humpback Whale Research Project team last conducted surveys in the waters of southern Zanzibar but, after much anticipation and planning, the team is back in Kizimkazi-Dimbani! Most of us arrived a week ago and from the get-go have been busy, busy sorting out permits, stocking the house with food and supplies, organizing research equipment, training new team members and looking at a site for land-based surveys for a pilot study we will conduct this year. This has been a very productive week and we even completed four boat surveys. The boat surveys are conducted to study the occurrence and behaviour of the humpback whales arriving here, for breeding and mating, from the waters of the Antarctic where they spent the winter feeding! This year the research team consists of three returning and three new research staff and students: Kristin, will once again be the Field Principle Investigator (her fourth season! ); Kyla, will be a research assistant (her second season) and will take over for Kristin when she leaves in August, and Yussuf, is returning as one of our local Zanzibarian research assistants (his second season). 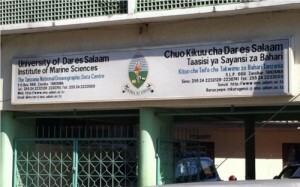 Yussuf graduated from the University of Dar Es Salaam last year and currently works with the Institute of Marine Sciences in Stonetown and we are very happy to have him back! In addition to the returning staff, we welcome four new assistants for 2012 including: Nat (Nathaniel Stephenson) and Lynne Payne, two, undergraduate 3rd year students from Newcastle University; Khamis, another Zanzibarian student from IMS; and, in mid-August, Jessica, will be joining us as a research assistant until the end of the season. In addition to the research team we will be working with our local captains, Khamis and Foum, again. Khamis has been working with the project for 15 years now and Foum 5 years and we are lucky to have them with us for another humpback whale research season! The project’s Principle Investigator, Dr Per Berggren of Newcastle University, also arrived last week to help with project start-up, help the new students settle in and to organise and participate in a workshop on whale fisheries by-catch mitigation and development of best practice for whale watching activities at the Menai Bay Conservation Area offices here in Kizimkazi-Dimbani. The workshop ran for two days and included presentations and discussion on increasing the use of weak links on fishing nets (to reduce whale by-catch), developing a commercial whale watch industry in addition to dolphin watching, and the development of regulations for both whale and dolphin watching activities. Overall, Per was very pleased with the workshop and felt the issues discussed were heading in a positive direction. 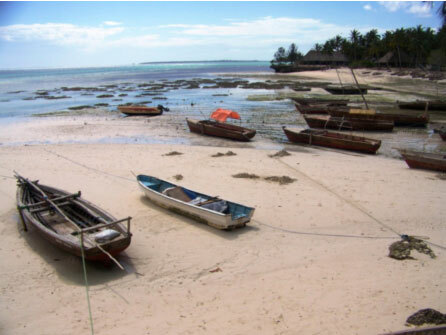 The beautiful beach at Kizimkazi-Dimbani – our home away from home!